By now you’ve surely heard the news. The SAT has changed. January 2016 marked the final date for students to take the old SAT exam. 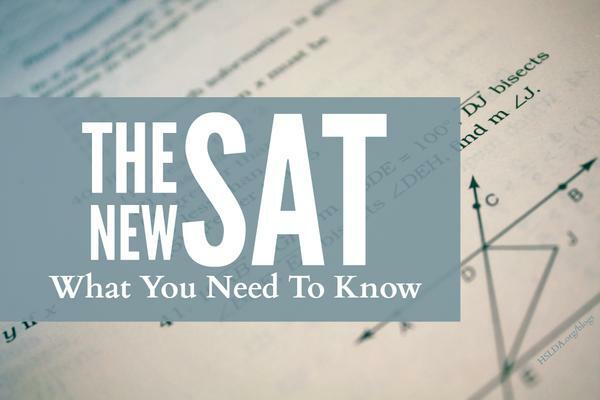 Starting in March 2016, the New SAT was the only option administered. It’s the biggest change to the SAT test in quite a long time, impacting students in the class of 2017 or later. When I was in high school in the late 90’s the SAT was a maximum of 1600 points and we had these terrible things called “analogies.” Cat is to kitten, as dog is to ___. But, of course, way harder. In 2005, the exam underwent a big change and the top score became 2400. Analogies were dropped. Some Algebra II concepts were added. Critical Reading and Math were joined by a third section: Writing. This brought along with it the mandatory essay. Now, in 2016, we see some more dramatic changes. It is switching back to the two major sections of Reading (renamed Evidence-Based Reading & Writing) and Math. The top score again is 1600. And the essay is optional. But let’s dive in deeper. Let’s look at 10 important SAT test changes that you should know about the New SAT via #infographic form! As shown in the infographic above, here are some important New SAT vs. Old SAT facts that you should know about! Old SAT: 1/4 point penalty for all incorrect answers. That meant that students had to be careful about guessing and just leave questions unanswered if they were not sure. Old SAT: The essay was only 25 minutes and required. You had to answer a prompt and cite evidence from memory or personal experience. I love that there are fewer answer choices per problem (one less option to give mental energy to eliminating or keeping is a great thing) and I love that there’s no penalty for incorrect answers. This alone should reduce some test anxiety and let students focus on answering as best they can and moving on. Great. So let’s look even more closely at the differences between the New and Old SAT in terms of time, number of questions, and types of problems in infographic number 2. Each test follows the same format of Reading, then Writing, then Math (no calculator), and then Math (yes calculator). Then for those students who are opting in for the essay, they stay for the essay at the very end. Each test started with the required essay. From there, there were always 3 Math (yes calculator), 3 Critical Reading, and 2 Writing with an extra section thrown in. It could be any of the types and it did not count toward your score, but you would have no idea which this ‘extra’ section was. And the order of things was variable and unpredictable. 8. New SAT: Reading = 65 minutes, 52 questions. All questions are based on passages. There are vocabulary questions but in context of a passage. And some passages include data or a chart that needs to be interpreted. Old SAT: Reading = 70 minutes, 67 questions. Many questions were based on passages, but they also have sentence completion problems which were stand-alone sentences that tested more difficult and obscure vocabulary. 9. New SAT: Writing = 35 minutes, 44 questions + optional essay. The New SAT writing questions are also more passage-based in testing grammar, structure, and punctuation. Old SAT: Writing = 60 minutes, 49 questions + required essay. Students had to fix sentences which, for the most part, stood in isolation (not in paragraphs or passage form). 10. New SAT: Math = 80 minutes, 58 questions. Math questions on the New SAT are more multi-step, have tons of word problems, and include higher level concepts than before, like trigonometry. Old SAT: Math = 70 minutes, 54 questions. The old SAT tested topics in Arithmetic, Algebra 1, Geometry, and a little from Algebra 2. The New SAT exam is far more passage-happy than ever before. Not only are the Reading and Writing sections solely passage based, now far more math problems are word problems too. They really are putting an emphasis on being able to read, understand, and translate information to demonstrate deeper grasps of important concepts. There are also fewer opportunities for ‘test-taking tricks’ to apply. That does not mean, however, that there aren’t still strategies and performance enhancement that comes from focused practice and review. That still holds true, as with any exam.